Aortic dissection is the most common and lethal of the acute aortic disorders, with a reported incidence of 0.2-0.8% . Risk factors for the development of aortic dissection include hypertension, cystic medial necrosis due to connective tissue disease (i.e., Marfan's and Ehlers-Danlos syndrome), congenital lesions such as bicuspid aortic valve and aortic coarctation, pregnancy, trauma, and arteritis. 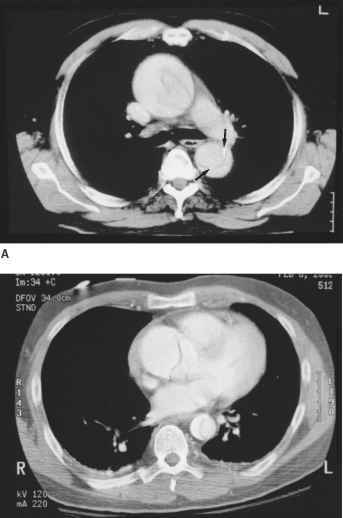 Patients who develop intramural hematomas, a variant of aortic dissection described below, may in a minority of cases develop communications with the aortic lumen thereby progressing to true dissection. 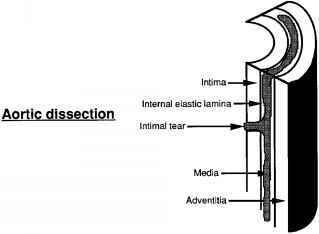 Thoracic aortic aneurysms are more prone to dissection, as aortic wall tension is directly related to luminal diameter (Laplace's law). There is a male predominance for the diagnosis in most reported series. 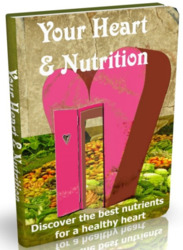 Symptoms on presentation include chest pain radiating to the back, syncope, and shortness of breath. Acute aortic dissection is defined as dissection detected within 2 weeks of the onset of symptoms, while chronic dissection is older than two weeks . Since the clinical presentation may mimic myocardial infarction, pulmonary embolism, and other conditions, the diagnosis is often elusive. Figure 4 (A-E) Diagram of aortic dissection and its variants. Figure 4 Continued ascending aorta with (Fig. 5) or without extension distally into the arch or descending aorta, and Type B dissection limited to the descending aorta. Approximately two-thirds of aorta dissections are Type A and one-third is Type B. The Stanford classification system has become the more widely utilized system, as there has been significant data published on the therapeutic and prognostic implications of Type A versus Type B aortic dissection. 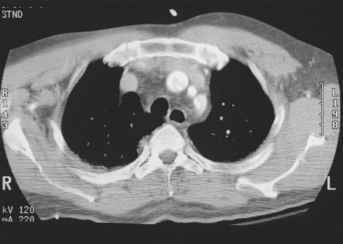 The chest radiograph is of limited value in the evaluation of suspected aortic dissection. Some patients with aortic dissection show mediastinal widening, aortic dilatation, and indistinctness of the aortic knob on frontal chest radiographs. Medial displacement of intimal calcifications greater than 1.0 cm from the lateral aortic margin has been described as an insensitive but fairly specific finding of aortic dissection in the appropriate clinical context, but this finding is not of value in the aortic knob where the arch is foreshortened and the calcification is unlikely to lie in the same coronal plane as that portion of the distal aortic arch that forms the lateral margin of the aortic knob. Figure 5 Stanford type A aortic dissection. (A) Enhanced scan at the tracheal carina shows an intimal flap within a dilated ascending aorta extending into the descending aorta with flow in both true and false lumina. Note displacement of intimal calcifications in the descending aorta (arrows). (B) Scan at the level of the aortic root shows the intimal flap at the sinotubular junction in the ascending aorta. 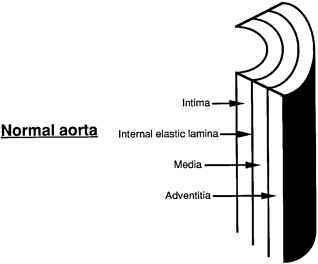 The false lumen is anterolaterally situated in the ascending aorta and posterolateral in the descending aorta. (C) Scan through the proximal arch vessels shows the intimal flap extending into the proximal brachiocephalic and left subclavian arteries. Figure 5 Continued provides rapid assessment of the aorta, including the presence or absence of an intimal flap, the status of the aortic valve, the presence of pericardial fluid, and the functional status of the myocardium. 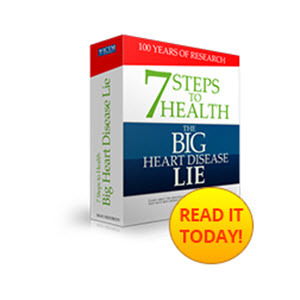 Limitations include availability; the inability to assess the status of the great vessels; and occasional difficulty in visualizing the entirety of the ascending aorta, arch, and descending aorta. Prior to the advent of spiral CT in the early 1990s, magnetic resonance appeared to be the modality of choice, with a reported sensitivity and specificity of 98% . In addition to its high accuracy for diagnosis, additional advantages of traditional (spin-echo and gradient-echo) MR include lack of need for iodinated contrast and the simultaneous evaluation of the aorta and great vessels, heart, and pericardial space in multiple planes. More recently the development of contrast- (i.e., gadolinium)- enhanced MR angiography has provided exquisite detail of the aorta and arch vessels with significantly reduced acquisition times, allowing complete aortic evaluation in a single-breath-hold acquisition. Recent studies have confirmed the excellent accuracy of MR for imaging aortic dissection but the more widespread availability of spiral CT and the greater ease of monitoring unstable patients in the CT suite has made this technique the more widely utilized imaging procedure for evaluation of suspected acute aortic disease, including dissection. Magnetic resonance is of particular value in monitoring the success of nonoperative management of dissection and in the postoperative follow-up of surgically managed patients. Conventional contrast angiography, while often utilized in the past for detecting the presence and extent of disease in aortic dissection, has been largely supplanted by the cross-sectional modalities described above. Angiography has been shown to be less sensitive than spiral CT, MR, and TEE for the diagnosis of dissection. However, if percutaneous techniques at managing aortic dissection, including percutaneous fenestration of the aorta and stent-graft obliteration of the lumen, become more widely employed, there may be increasing utilization of catheter angiography for both diagnostic and therapeutic purposes. Spiral computed tomography has become a mainstay in the imaging diagnosis of suspected acute aortic dissection due to its widespread availability and high image acquisition speed; proximity to the emergency room at most institutions; uniform high-quality axial and multiplanar-reconstructed images; and ability to simultaneously assess the entire aorta and arch vessels, pericar-dial space, and the remainder of the thorax. In a 1996 study by Sommer and colleagues, spiral CT had a 100% sensitivity and specificity in the detection of aortic dissection . The technique used for the evaluation of acute aortic dissection is shown in Table 2. 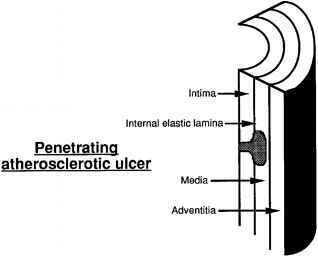 Initial unenhanced scans are performed to detect medially displaced intimal calcifications or to visualize an intimal flap in patients with severe anemia , with either finding indicating the presence of a false lumen. In addition, the presence of an aortic intramural hematoma that may mimic aortic dissection clinically is depicted on unenhanced scans as a crescentic region of intramural high attenuation that can be mistaken for a thickened aortic wall if only contrast-enhanced scans are obtained. In patients with significant renal insufficiency, either of these findings on unen-hanced CT may be sufficient for appropriate diagnosis and triage without the risk of inducing contrast-mediated renal failure. The contrast-enhanced CT scans obtained in patients with suspected dissection should begin above the aortic arch to include the proximal arch vessels and extend to the level of the common iliac arteries inferiorly. Since a large number of axial images are obtained with the use of thin collimation and overlapping reconstruction, particularly with the newer multidetector-row CT scanners, the study is most easily interpreted on a workstation where cineview-ing is possible and multiplanar reformatted images, particularly oblique sagittal reconstructions, can be created. The CT diagnosis of aortic dissection is made by detection of an intimal flap separating the true from false lumen (Fig. 5). In type A dissections, the false lumen is typically seen along the right anterolateral wall of the ascending aorta and spirals as it extends distally to lie along the left posterolateral wall of the descending aorta. While it is often helpful in Type A dissections to determine the presence of involvement of the arch vessels, this does not usually alter the surgical approach to the patient. Computed tomography findings associated with dissection include pericardial or pleural effusion and aortic dilatation. While the primary goal of imaging is to establish the presence of a dissection, the complications of aortic dissection are also readily depicted on spiral CT. These include aortic branch vessel occlusion, specifically involvement of the arch vessels or renal or mesenteric vessels; aneurysm formation; hemopericardium with tamponade; and rupture with mediastinal or pleural hemorrhage (Fig. 6). The presence of aortic regurgitation or the development of myocardial infarction from proximal extension of a dissection are best evaluated on TEE. Figure 6 Ruptured thrombosed Type A aortic dissection. (A) Unenhanced CT shows crescentic high attenuation material surrounding the ascending aorta. (B) Contrast-enhanced scan at the same level as (a) shows no enhancement of the crescentic density, indicating either a thrombosed false lumen or an intramural hematoma. 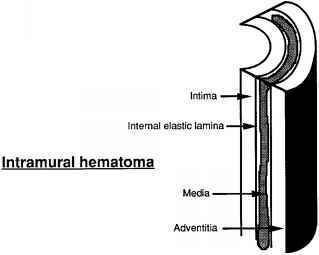 There is hematoma (h) within the middle mediastinum and surrounding the left lower hilar arteries. 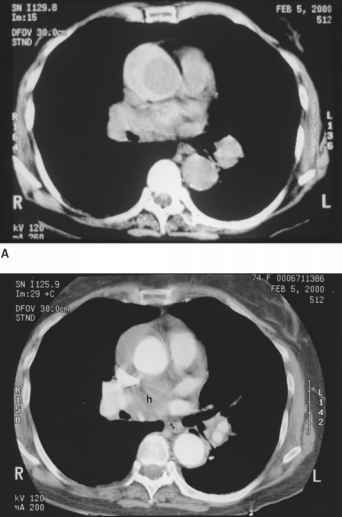 Surgery confirmed a thrombosed Type A dissection with mediastinal leakage, which was successfully repaired. The role of computer-generated two-dimensional (multiplanar or MPR) and three-dimensional (multiplanar volumetric or MPVR) reconstructions in the evaluation of aortic dissection is limited. While single-voxel-thick (two-dimensional) oblique sagittal MPRs and curved planar reformations (CPRs) obtained parallel to the long axis of the thoracic aorta allow for simultaneous display of the entire aorta and arch vessels, the additional diagnostic value provided is minimal. CPRs can help depict the relationship of the intimal flap to great vessel ostia . Volumetric reconstructions (MPVRs) performed with maximum intensity projection (MIP) and shaded surface display rendering techniques have a limited ability to depict intimal flaps and therefore are the least valuable of the reconstruction algorithms in evaluating aortic dissection. There are several pitfalls in the interpretation of CT aortography for the diagnosis of dissection. These include factors that can produce the false appearance of an intimal flap and insufficient vascular enhancement to allow detection of an intimal flap . 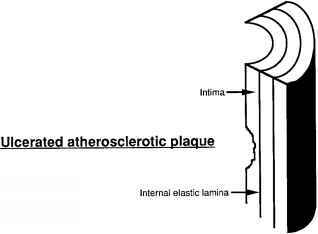 The most common cause of a pseudodissection is a curvilinear streak artifact in the ascending aorta related to the pulsatile movement of the aortic wall between end diastole and end systole . These artifacts are typically seen along the left anterior and right posterior aspects of the ascending aorta and are minimized by use of a 180° linear interpolation reconstruction algorithm . Other common causes of streak artifacts in the aorta include dense contrast in the left brachiocephalic vein (from a left arm contrast injection) or superior vena cava and mediastinal clips or in-dwelling tubes or catheters. In addition, any high-attenuation structure that contacts the enhancing aortic lumen can simulate an enhancing false lumen and produce the appearance of an intimal flap. These include an enhanced left brachiocephalic, superior intercostal, or left inferior pulmonary vein and curvilinear atelectasis of the left lower lobe. The natural history of medically managed acute Type A dissection is associated with a 3-month mortality rate of 90% , rendering surgical repair the treatment of choice in Type A dissection in operative candidates. Alternatively, the survival rate for medically managed Type B dissection is 73% at 1 year: This in combination with a high rate of paraplegia and death (up to 65%) in surgically managed Type B dissections warrants medical therapy in this group unless there is the development of aneurysm, rupture, or proximal extension into the arch and ascending aorta. Although the traditional approach to Type A dissection is immediate surgery and Type B medical management, recent data suggest that some Type A dissections, particularly where the diagnosis is delayed several days after onset of symptoms or patients are considered poor surgical candidates, may be managed with semielective surgery or even aggressive medical therapy alone with good outcomes. Patients with Type B dissections complicated by ischemic injury to the kidneys, spinal cord, bowel, or legs; rapid enlargement; rupture; intractable pain; or proximal extension require surgical repair.